This is the largest fragment of the ammonite. It is not a lot to look at, I admit, but it is an important indicator of the time the sediments were deposited and the chemistry of the seawater when the animal lived and died. It is an internal mold, meaning that it is the sediment inside the shell after the shell dissolved. 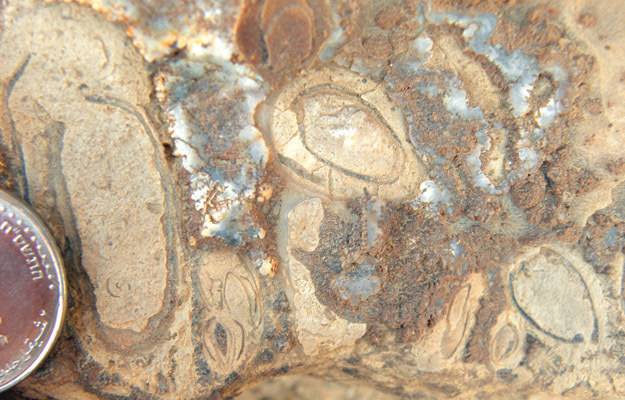 What is significant here is that this mold is encrusted by oysters (one is indicated), serpulid worms, and foraminiferans, showing that the shell dissolved and the sediment cemented early on the seafloor -- an example of "Calcite Sea" geochemistry. 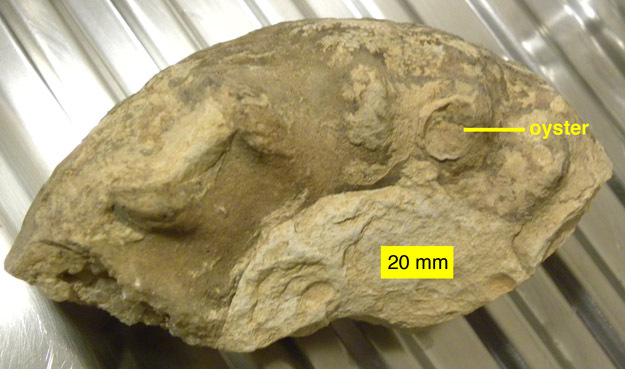 On the left is a closer view of the outside of the ammonite internal mold. Note the pattern of oval-shapped divots. I have no idea what they are, but they represent some sort of objects that were in the shell before it dissolved away. On the right is a close-up of the complex ammonitic suture, which was the boundary between the internal septal walls and the outer shell. That’s probably enough paleontology for the day. If anyone wants to identify this ammonite before I get home, I’ll be grateful! MAKHTESH GADOL, ISRAEL–The fieldwork could not have been better, although if you watched me all day in the desert sunlight you would have thought otherwise. 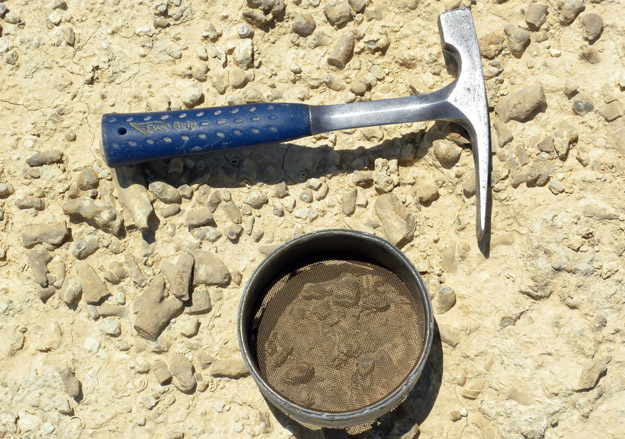 After I hiked up into the Matmor Hills to find the right horizon, I spent hours in the same place collecting fossils off the surface and sieving the sediments to obtain tiny shells (especially of thecideide brachiopods). The goal is to thoroughly understand the paleontology of this unit, including how these organisms interacted with each other in that ancient Jurassic sea. The persistence paid off with a diverse set of brachiopods, corals, sponges, echinoids, serpulid worms, bivalves, gastropods, and the first ammonite I’ve seen in the Matmor Formation. There is enough complexity in this one site to support at least another two Senior Independent Study projects. This view of a coral in cross-section shows how complex bioerosion can be. You can see several holes in the brown coral matrix filled with light tan sediment. Inside these borings are cross-sections of bivalve shells. Note that some borings have more than one set, meaning the hole was occupied by nestling clams after the borer died. The patches of shiny grey are silicified regions of the coral skeleton. Since the coral was aragonitic, its original skeleton has been replaced by several minerals.